See guest artist Courtney Dodd during a live, narrated demonstration in the Amphitheater Hot Shop on June 21 from 6 to 8 pm. Courtney Dodd is a full-time artist who lives and works in the mountains of Bakersville, North Carolina. She's worked for Devin Burgess, a former resident at the Penland School of Crafts. In 2012, she completed a residency in photography at Oregon College of Art and Craft in Portland, and, in 2015, she was the glass resident at STARworks in Star, North Carolina. Dodd has studied and worked at Penland School of Crafts, The Corning Museum of Glass, Urban Glass, Denmark Design School in Bornholm, and Pilchuck Glass School. She has demonstrated at STARworks, Chrysler Museum of Glass, and the University of Louisville. 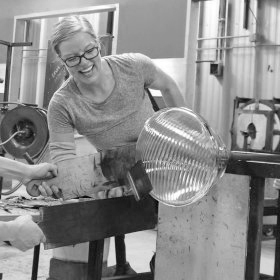 Dodd has assisted Pablo Soto at Desoto Glass Design in Penland, North Carolina, and in 2017 was featured as an Emerging Artist in Residence at Pilchuck. Courtney Dodd was a Core Fellow at Penland School of Crafts from 2006-2008 and later worked for Devin Burgess, a former resident at Penland. Dodd holds an MFA from Virginia Commonwealth University with an emphasis in glass, and a BFA from Missouri State University with a dual emphasis in graphic design and illustration.